So excited to show you this set from The New Black! 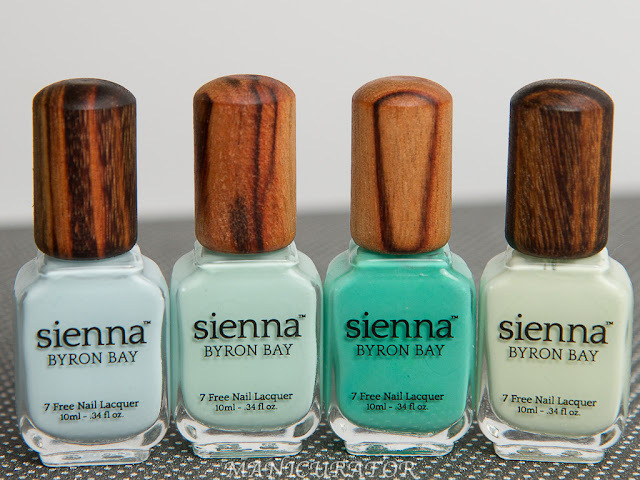 This is part of their Ombre collection which retails for $22 at Sephora and Beauty.com. The Floyd set contains 5 (4ml) mini bottles in pink shades. I know it's called an ombre, but I found it to be not a true ombre because the shading of light to dark in the same color family was a little bit too "jumpy" for me. However...I LOVE this set and the colors complement and look great together. Pink - Carnation pink with silver shimmer. Perfect in 2 coats. Fuschia - A jelly neon, this one is a darkish pink with a hint of purple. Hot pink - Another jelly neon, gorgeous bright pink. I had a hard time photographing the jellies, this one kept wanting to be red in photos. Both of the neons are very pigmented and dry somewhat matte. 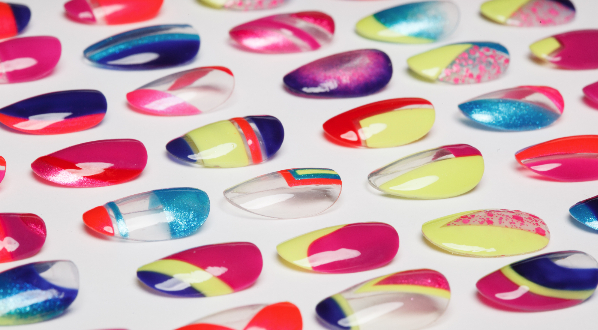 You can get away with one coat of these if you wanted. Rose - Beautiful medium pink with gold shimmer. Perfect in 2 coats. Light pink - Very pretty light pink creme. This is the only one of the bunch that gave me application problems. Streaky and needs 3 coats. But not a deal breaker by any means. I had to play around with the color balance a bit to try to get the photos to be as color accurate as I could. Like I said, the jelly colors did not want to cooperate. The photo above I think, is pretty accurate! I will buy you a polish of your choice if you post something sloppy just once. These look sooo good! 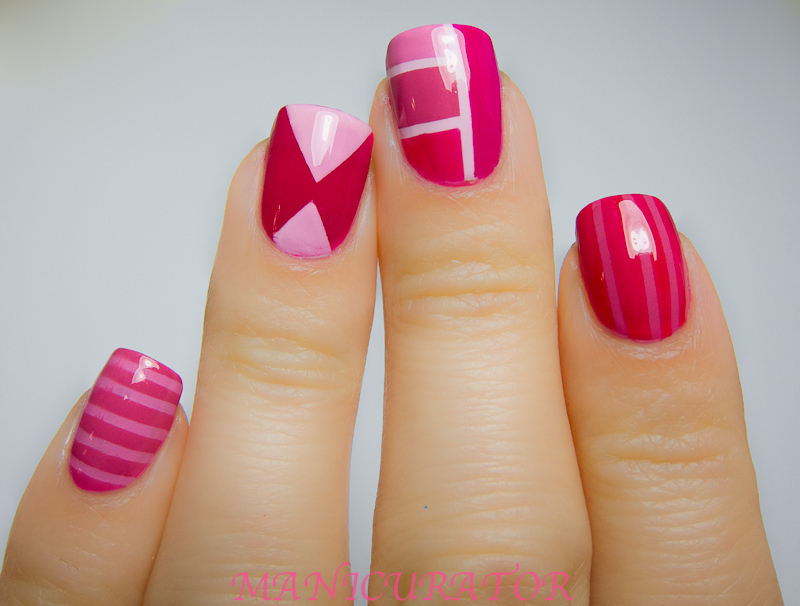 The pinky nail reminds me of a Victoria's Secret shopping bag! loving this! was it all free hand? Looks great! 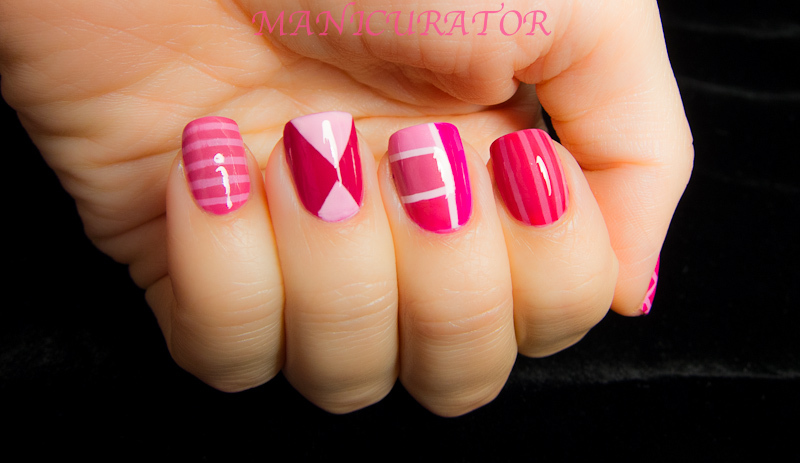 I wish I had the patience to do something different on each nail, haha! oh my goodness this is so fabulous!! I love it!! I LOVE IT! 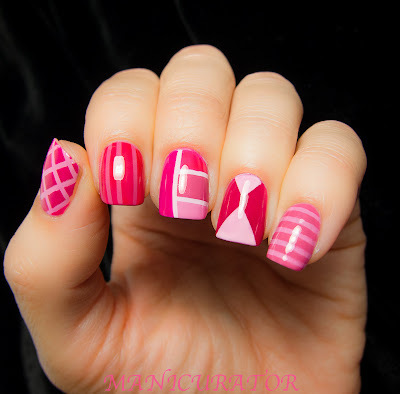 this is the best use i've seen of these ombre sets - nice! Very kind! Thank you much!! 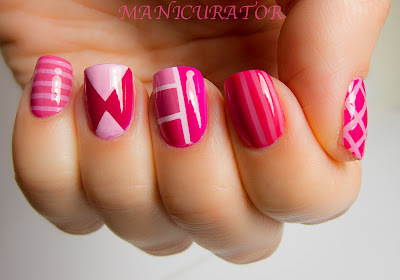 saw this on Berry Polished FFF, and fall in love on the spot!! Following you now!! Thank you Lenny! Very sweet :) I'm following you too now. 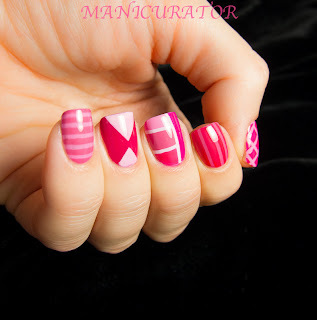 Pinned your color block too! Amazing! What brand is the white stripe? It's a pen, yes? The white pen "french mani pen" my daughter was given for her birthday, does not work properly... GORGEOUS nails. Hi Julie, thanks!! The white, isn't white...it's the light pink from this set, used as a base. I used striping tape to get the clean line.